OSIRIS-REx Spacecraft Arrives at Asteroid Bennu Monday! I'm a big Snow Patrol fan and they recently put out a new music video called "Life On Earth." If you a fan of space then this music video is not to be missed. It features some (European Space Agency) ESA testing facilities in the video, which is pretty cool since I have actually visited several. Can't wait for their new album to come out next month! Interstellar is one of my favorite movies of all time and the soundtrack to the movie, which is composed by Hans Zimmer, is simply jaw dropping. The strong organ presence in the soundtrack also really draw me to the music because I first learned to play the organ as a young child before later moving on to play piano and keyboards. So what's the story behind the Interstellar Organ? What organ was used and why did Hans Zimmer and Christopher Nolan (the director) end up choosing the organ as such a central instrument? Like everyone else today I did a bit of searching on the internet. Turns out the decision to use a pipe organ as a central instrument in the score was first brought up by Christopher Nolan and Hans Zimmer quickly jumped on the idea and the rest was history. "Abbey Road Mobile set up a remote studio in one of the side rooms of the church. It wasn’t just the organ; we had the orchestra in there as well. So we had an enormous amount of microphones placed all throughout that church. But I think the main mics really were a few Neumanns, about 20 feet away. More were about 40 feet away from the main pipes." "It was great being able to really use the space. Because an organ doesn’t exist outside its acoustic space, so you have to find the right space. The great thing about Temple Church is, it’s in the center of London but it’s completely isolated. There are just the law courts all around it, and it’s basically a pedestrian zone, so there’s no traffic noise." 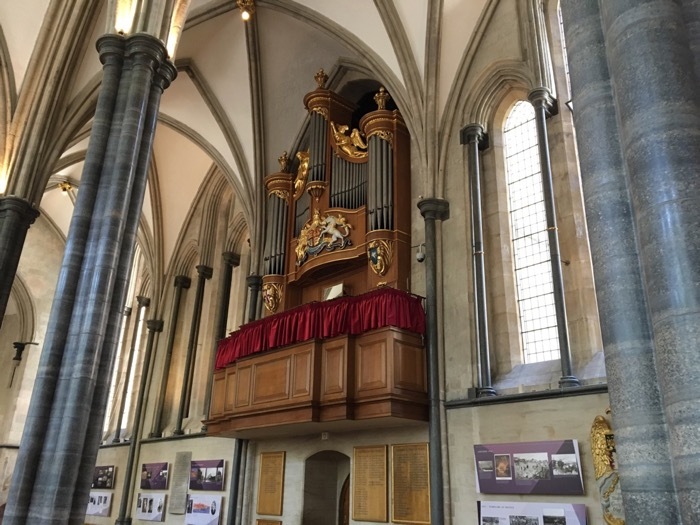 "As Zimmer recently told the Film Music Society, the organ was chosen for its significance to science: From the 17th century to the time of the telephone exchange, the pipe organ was known as the most complex man-made device ever invented. Its physical appearance reminded him of space ship afterburners. And the airiness of the sound slipping through pipes replicates the experience of suited astronauts, where every breath is precious (a usual preoccupation with sci-fi movies that is taken very literally in Zimmer’s music, which also features the exhalations of his human choir)." Now its time for the real content. I want to share with you a short piece of audio I took with the built-in mic on my iPhone. While we were visiting the Temple Church there was a small acapella men's group practicing. Honestly, the visit to the Temple Church would not have been complete without this amazing audio demostration. Granted it would have been even better to have heard the organ being played, but then again maybe not. You expect room filling sound with an organ but the way this small group of human voices filled the volume of the church was simply amazing. I chose to use this short clip as my video for one reason...the singers stop to correct a mistake. Honestly, if they had not have stopped you could have easily assumed I simply subbed over a silent video with CD quality singing. So plug in some headphones, close your eyes and imagine you are standing in the middle of the Temple Church listening to this small group of singers. 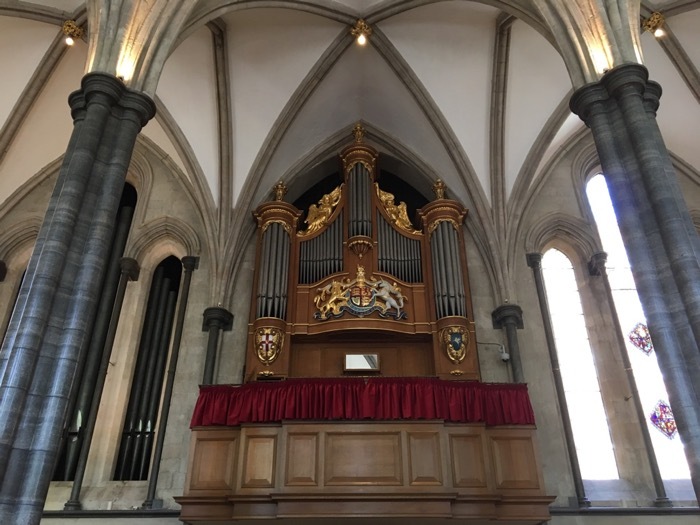 Its one thing to watch the Interstellar movie or listen to the soundtrack, but its quite another to witness first hand the acoustics of the Temple Church. After being there in person I no longer have to question why this organ and this church were chosen to be part of the soundtrack for the movie. If you ever go to London, take some time to stop by this beautiful church and see and listen for yourself!